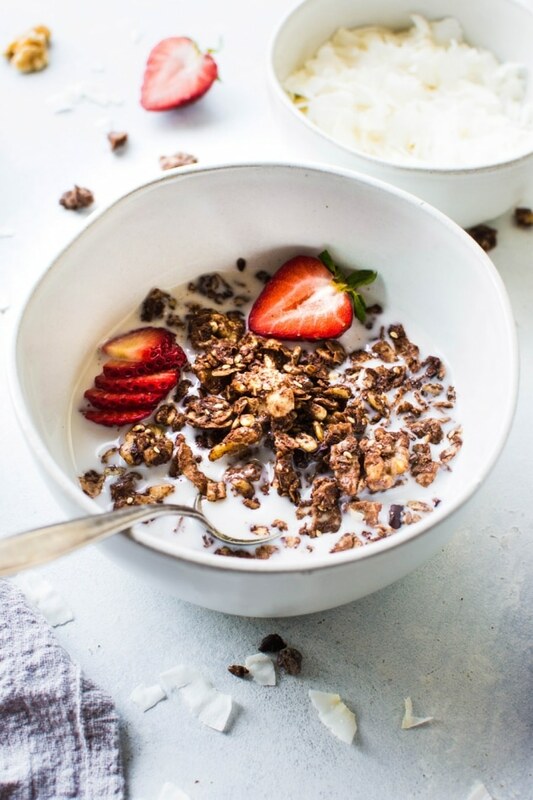 This easy dark chocolate paleo grain free granola is gluten free, dairy free, and packed with all the things you love about granola without any of the grains. Easy to make, good for you, and so freaking delicious. I know it’s going to earn a fast spot in your heart and in your kitchen! Okay guys. It’s the weekend. Let’s talk granola. Love it? Hate it? Have a favorite brand? Ever tried making it? Sorry that was a lot of questions. Hope I didn’t scare you away. Bear with me! This topic is worth a chat. Homemade granola is something I make on a super regular basis for the family that I work for. It’s one of those pantry essentials that’s as necessary to have stocked as milk and eggs. So I’ve really gotten the whole granola making thing down, and trust me, it’s not half as hard as you think it is. BUT, while I do occasionally eat oats if they’re gluten free, I just feel better if I avoid them, or at least have them in moderation. 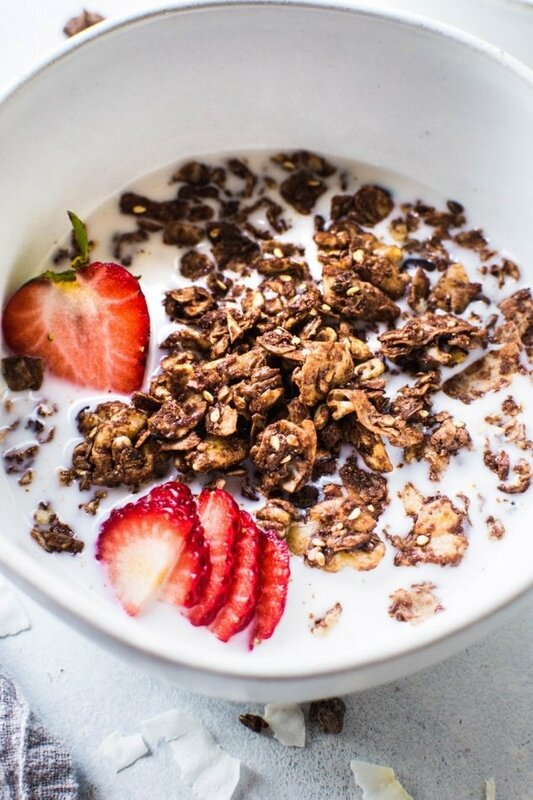 And you and I both know that for better or for worse, when it’s good, granola is not one of those things that you eat in moderation. Am I right? If it’s on my counter, I’m gonna eat it every morning for breakfast. Either straight up with almond milk and some fresh berries, or sprinkled over my smoothie (so good. go try it.) 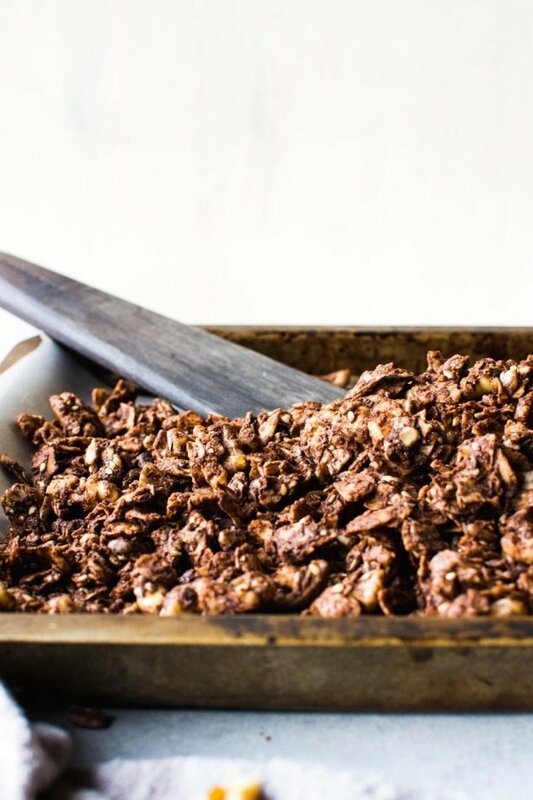 Especially if it’s this easy dark chocolate paleo grain free granola. Because granola with oats is not the only option! 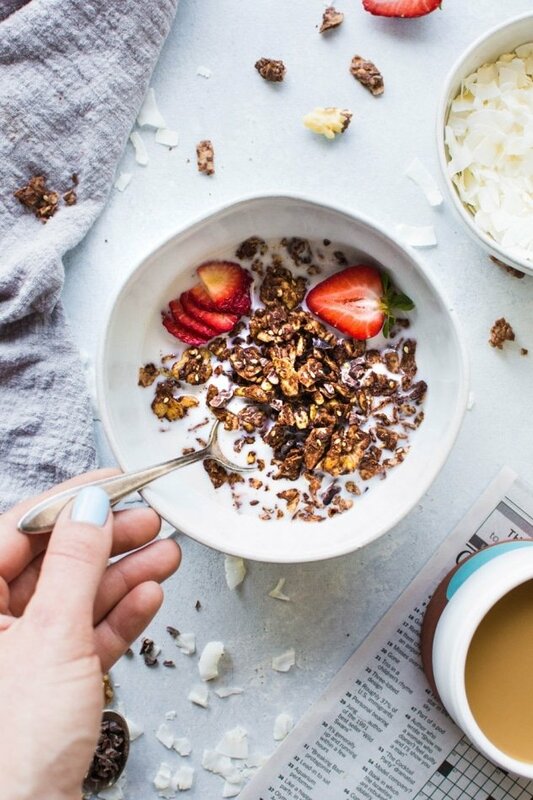 Paleo friendly grain free granola is totally a thing and it is totally worth trying. 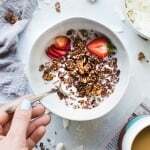 what is grain free granola? In short, grain free granola is granola without any grains! (duhh of course you knew that) Let’s get a little bit more specific. While granola has kind of become synonymous with grains, this version subs in nuts and seeds for the grains creating a more nutrient dense and deeply satisfying alternative. It’s held together and sweetened with almond butter and maple syrup, and spiced up with some vanilla extract, cinnamon, and chocolate. More nutrients and it will keep you full longer? Sign me UP! 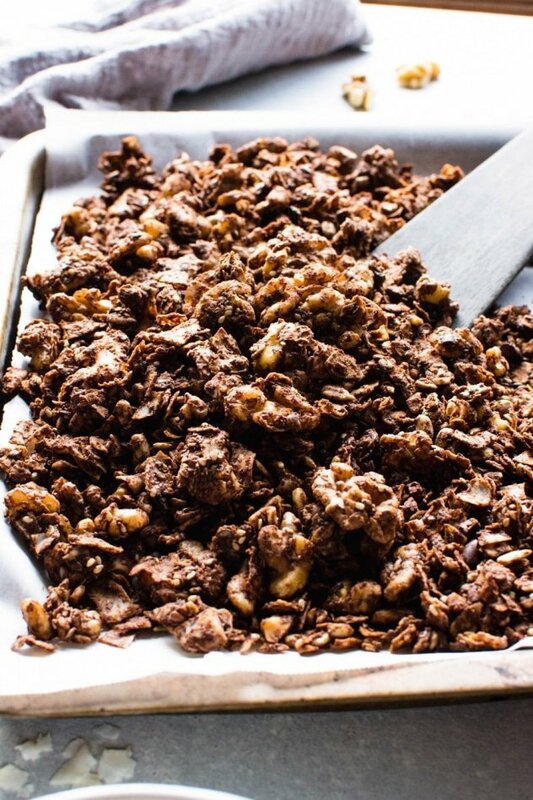 Once you get the basic recipe formula and technique down, homemade granola – grain free or otherwise – is really super easy to make. But no matter how easy it is to make, buying it at the store is probably easier, right? So why even bother? Well, like anything, when you make it at home, YOU get to control the ingredients. Which in this day, is a really important thing. So many boxes and bins of granola at the grocery store try and pass for “healthy”, when in reality they can be completely loaded up with sugar (sometimes even with the dirty dirty high fructose corn syrup), highly processed inflammatory oils, grains, and flavor additives. That’s not the type of thing I want to have in my morning routine, or ever really. And while their are some health wise store bought options, they tend to be pretty expensive, and honestly I’ve yet to find one with the same YUM factor that the homemade stuff has. Especially when it comes to the grain free variety. Not to mention, when you make it yourself, you can customize to add all the things to it that YOU want… like umm CHOCOLATE. Because chocolate = happy business. Like literally. When you use the good stuff, it makes you happier! Why? Because it contains an amino acid called tryptophan, which helps your body facilitate the production of serotonin. Literally the happy making neurotransmitter. Hellloooo raw cacao powder! Get in ma granola. But if you’re looking for these positive effects, you should ditch your hershey’s cocoa powder, or any COCOA powder for that matter, and opt for raw cacao powder instead. They ain’t the same thing. WHICH = more nutrients, antioxidants, amino acids, etc etc etc. In short, much better for you. And usually processed with high heat techniques, which degrades the nutrient content and can even damage the cell structure of the cacao. Raw cacao powder can be somewhat more pricey, but luckily with it’s popularity boost there’s more and more affordable options out there. Trader Joe’s just started carrying an organic fair trade 8 oz bag that is only $3.99!!!! That is insanely cheap. And of course there’s always the ever-so-amazing Thrive Market option. I use their online grocery service for nearly all of my pantry needs. They offer steep discounts on many organic, paleo, vegan, and health food brands to help ease the burden on your wallet of eating healthy, and I know for certain they have a killer deal on a 16 oz bag of raw cacao powder. If you use this little link below you’ll get an EXTRA 20% off your first three orders. YUP. Go get yourself some CHOCOLATE! But let’s get back to the nitty gritty details. I always say I’m going to write shorter posts for you guys, and then I start and I just have so much to SAY on the topic. Forgive my rambling and just go ahead and jump down below to the recipe if I’m boring you  I promise not to be offended. 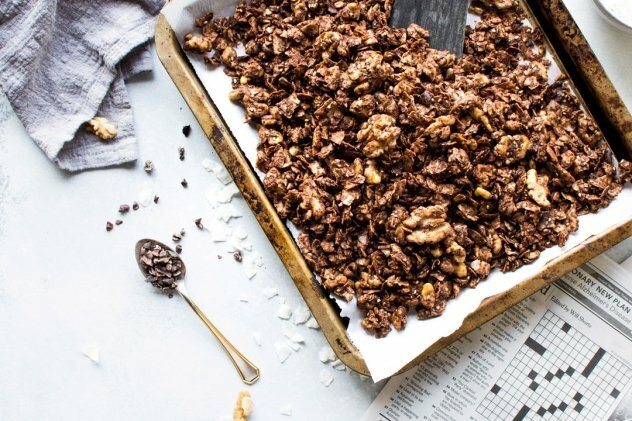 All that’s standing in between you and this easy dark chocolate grain free granola is your some nutrient dense ingredients, a baking sheet, a warm oven, a big bowl, a spoon, and 30 minutes. The wet ingredients get mixed together first, after which you add the dry ingredients and stir to thoroughly coat. The whole chocolate-y mixture is spread in a thin even layer on your baking sheet and popped into the oven for 15 minutes. At that point you’ll want to take it out and stir it, moving the granola that’s on the edge of the pan into the center and vice versa, and bake it for another 10 minutes. Take it out and do the same thing one more time, and then return it to the oven for a final 5 minutes. It won’t be super crispy until it cools, so give it a little time to chill on the counter before digging in. Preheat oven to 310 degrees. In a large bowl, mix together almond butter, maple syrup, sea salt, vanilla extract, cinnamon and cacao powder until thoroughly combined. 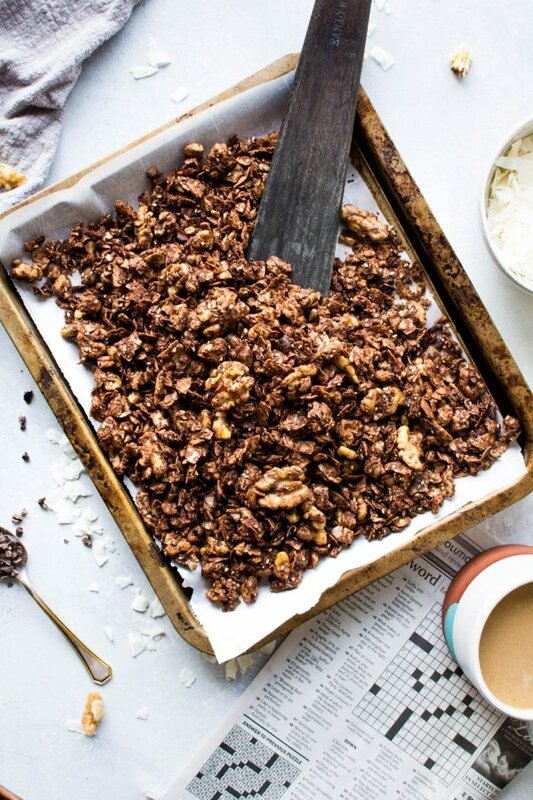 Add coconut flakes, flax seeds, sesame seeds, walnuts, sunflower seeds and cacao nibs if using and stir to coat with a stiff spatula or wood spoon. Spread in a thin, even layer on a lined baking sheet and bake for 15 minutes. Remove from the oven and stir. Return to the oven and bake for another 10 minutes. Stir again and return to the oven for another 5 minutes. Remove and allow to cool on the baking sheet until dry and crisp. Store in an airtight container on the counter for up to a week! This entry was posted in breakfast and tagged breakfast, brunch, chocolate, easy, gluten free, grain free, granola, healthy, paleo, vegan, vegetarian on May 5, 2018 by Nyssa Tanner. Hi, Nyssa! – This looks delicious. What would be a serving size? And do you know the calories? I think I’m going to try it.